(Lancaster, Pa., Feb. 7, 2018) - Speedster Darian Sandford and slick fielding shortstop Vladimir Frias will both make returns to the Lancaster Barnstormers in 2018, it was announced today by manager Ross Peeples. 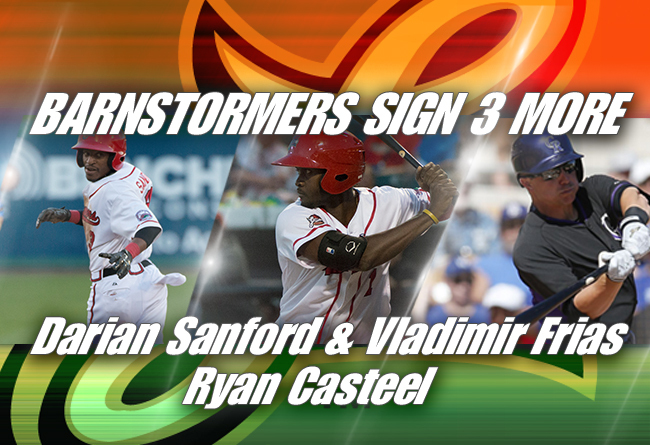 In addition, the Barnstormers have also signed slugging catcher/first baseman Ryan Casteel. Sandford, 30, was a sensation with Lancaster in 2017, batting .324 and stealing 45 bases in 60 games. The center fielder, originally from the St. Louis area, opened the season in Lancaster, batting .340 and leading the league in steals with 33 in 48 games, when the Washington Nationals purchased his contract from the Barnstormers on June 15. Sandford was assigned to Class AA Harrisburg and hit .226 with 21 steals in the Eastern League over a 50-game stretch. Upon the conclusion of the Eastern League season, he was granted his release by the Nationals and returned to Lancaster for a stretch run. He reached base in 11 of his first 15 plate appearances after rejoining the Barnstormers, a stretch which included a game-winning two-run single in the ninth inning at New Britain on September 6. The stretch in Harrisburg was Sandford’s first since playing at the rookie level in the Kansas City Royals organization in 2011. In five seasons of independent baseball from 2012-16, the switch hitter swiped 326 bases in 386 games in four separate independent leagues, including a career high 99 with Vallejo of the Pacific Association in 2016. Frias, 31, was Lancaster’s everyday shortstop from the start of the season until his contract was purchased by the Arizona Diamondbacks on July 18. With the Barnstormers, the native of the Dominican Republic batted .277 with five homers, including a grand slam against Southern Maryland on May 10. He drove home 30 runs and stole a dozen bases. Like Sandford, Frias had his first opportunity to play in a Major League organization for the first time in several seasons, spending time with both Class AA Jackson and Class AAA Reno over the remainder of the 2017 season. The switch hitter previously played in the Giants, Red Sox and Cubs systems, most recently in 2013. Initially, he signed with San Francisco in 2008 out of Tennessee Wesleyan. Casteel, 26, joins the Barnstormers for the first time. The right-handed batter has played eight previous professional seasons with the Colorado Rockies and Seattle Mariners organizations, peaking at Class AAA. In 2013, the catcher/first baseman cracked 22 home runs for Class A Modesto while batting .270. Last season, the Tennessee native appeared in 100 games for the Mariners’ Class AA affiliate in Little Rock, AR, batting .272 with a dozen long balls and 61 RBI. He has also played winter baseball in Australia, the Domincian Republic and Mexico and appeared in the Arizona Fall League during the scope of his career. The signings give the Barnstormers 11 players under contract for the upcoming season.